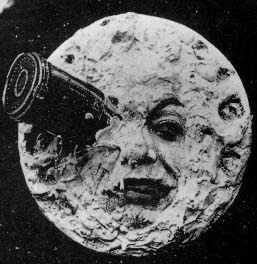 I'm not sure why I always assumed that the moon in Méliès’ A Trip to the Moon (1902) was a man. It could be anyone under all that goo. I think it’s mostly because whenever I read about the movie, the writer would inevitably make that common reference to “the man on the moon.” But it isn’t a man, there’s a woman gamely performing in that mask of plaster (or whatever it is). Her name is Bleuette Bemon (Bernon on the IMDB). Méliès recruited most of his performers from the stage, and he discovered her singing in a Parisian cabaret. In 1899, she made her film debut in Cendrillon (Cinderella), though I am not sure of her role (was she Cinderella?). According to the IMDB, she also appeared in Joan of Arc (1900), Bluebeard (1901) and Fairyland: A Kingdom of Fairies (1903). 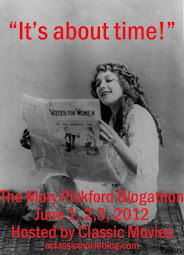 I wouldn’t be surprised if she appeared in more Méliès films, though I was not able to confirm this. Whatever else Bemon did, there’s no doubt that playing the moon for a brief moment will be her claim to fame. It is remarkable the way that image has symbolized the early days of film for so many years. It continues to inspire admiration and awaken imaginations. I didn't know that about the moon as well, thanks for the interesting story! Your ship definitely looks awesome and the picture is adorable. So glad your child will be blessed with the knowledge that not all great entertainment is in color! Thanks! Yes, I'm very pleased that she's going for both the B&W and the silent elements. And with no encouragement from me!